A Catholic SS officer suddenly realizes that the Third Reich is murdering innocent men, women and children on a massive scale and thus tries to get the Pope to bring it to the world's eyes. With help of a devote priest, can they convince the Pope and the powers behind him to do what is right or will they stay quiet in fear of Nazi retaliation? This is a very interesting take, or lack there of, of the Church's role in the silence of the Holocaust. 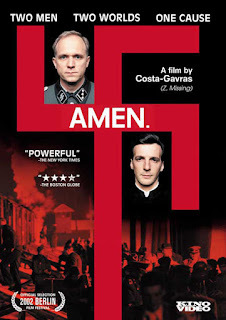 Not a film for the squeamish but a sobering look at the realities of WWII. View the trailer below.